It has been our pleasure to interview Rosa Ana Malvar Pintos last week. 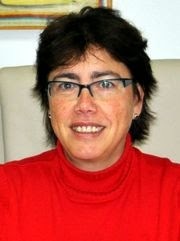 She is a professor at the Galician Biological Mission of CSIC (Pontevedra, Spain). Rosa Malvar earned a Bachelor’s in Biology at the University of Santiago de Compostela (1984) and a PhD in 1989. After postdoctoral stints at the Agricultural University of Wageningen (the Netherlands), in 1991, she joined the Spanish Council for Scientific Research (CSIC) to the Galician Biological Mission (MBG, Pontevedra) as head scientist on the Maize Genetics and Improvement Team. She is currently a research professor for the Spanish Council for Scientific Research at the Galician Biological Mission, where she was director from 2002 to 2011 and deputy director from 1994 to 2002. She has participated in many national and autonomous community R&D projects. She is the author of over one hundred original research works and has also co-written articles, book chapters and engaged various publishing-related activities. Her teaching activities focus on participating in doctoral courses and Master’s degrees at the Universities of Vigo and Lleida. ARJ: Could you please give a brief introduction of your research? My research focuses on plant breeding. Specifically, I research how to improve maize against pest attacks. There are three issues I am currently working on: the causes which produce the negative relationship we found between resistance to pest and crop yield; what genes are related to the resistance or tolerance of plant pests and what defense mechanisms (constitutive or induced) expose plants to insect attacks. ARJ: Did you find any difficulty or setback to become who you are (academically speaking) today? Academically speaking, the weakest stage of the Spanish university system is at the postgraduate level. It was during my time and unfortunately, still is. There are a great deal of Master’s programs whose usefulness is doubtful, to say the least. In my case, I made up for this lack with excellent directors during my PhD, not because the doctoral program was good (it was virtually non-existent), but because my director was always concerned about my receiving complete training. ARJ: Would you change anything in your academic career path to get here? I would basically not. I would have liked to have had the current opportunities for ready mobility and connection between research groups at the beginning of my career. ARJ: Which factors do you find most important for reaching success in the world of research? First of all, good training, and I do not just mean amount of knowledge: You have to learn how to research. To do so, pre-and postdoctoral periods are critical. Just as important is knowing how to work in groups. Today it is impossible to research in isolation. It is essential to know both how to relate with your superiors, and with your colleagues and, when the moment comes, with your subordinates. All of my achievements are due to the group that I have been working with for almost 30 years. ARJ: Do you consider that you have spent your time in the best way? In other words, do you have a global time management plan? I do not have a global time management plan. In any event, I think I have managed time satisfactorily. For example, with few exceptions (which do exist) I try not to take work home. ARJ: How do you normally plan your work? Do you make a list of daily tasks or goals to achieve? The way I organize work is determined by two factors: 1) working with a culture that has its own cycle, so that all the research planning is marked by growing maize, and this requires advance planning by the whole team and 2) calls for projects and contracts for theses also have a cycle that forces you to plan ahead. Urgent issues always come first, and that applies to people too. For example, correcting a thesis can be a priority because this person has a specific period of time to write it in. ARJ: Have you felt overwhelmed at some point by a high workload? Sometimes I have, but I've solved this by taking work home or putting non-urgent things on hold.